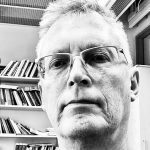 Our collaborator Mauri Kaipainen is professor of Media Technology at Södertörn University (Sweden). He studied education, musicology and cognitive science at the University of Helsinki and earned his PhD in 1994 on a computational model of the musical knowledge ecology. Before the present he has been affiliated as professor of applied cognitive science at the Media Lab of University of Art and Design Helsinki (2000-04, today Aalto University). There he worked with a number of media projects, including narrative spaces and logics, e-participation, cultural heritage and language technology. As professor of new media af the Dept. of Informatics, Tallinn University (2005-08) he established the international master programme Interactive Media and Knowledge Environments. His current research agenda focuses on the concept of interactively explorable multi-perspective media, based on ontospaces, spatially defined ontologies. The ontospace conceptualization has a range of applications in media art, community and collaborative media applications, generative narrative systems and learning environments with collaborative knowledge building.